I was one of the brave and foolish who bought their iPhone on rollout night last June. I wanted to buy a case before I left the store, as I already knew that my little slippery little slab of metal and plastic was just waiting to slip out of my hands, and plunge to the hard, unyielding floor. The selection of cases on rollout night was sparse, there were only a few to choose from. I walked out with the Speck ToughSkin. 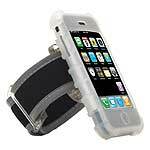 The ToughSkin is two parts; a rubber sleeve, and a plastic belt clip into which the sleeve-encased iPhone clips. The rubber sleeve is very grippy, with holes in the appropriate places for speaker, microphone, camera lens, etc. However, the volume rocker switch is covered by the rubber sleeve. Speck’s belt clip is a rather large plastic holster, with two small clips that snap around the middle of rubber sleeve. The clip itself can latch open, allowing you to stand the iPhone up, for those time when you want to watch the whole of Dr. Zhivago without having to hold the iPhone in your hand. For iPhone protection, the rubber sleeve is great; the iPhone won’t be slipping out of your hands due to the grippiness of the rubber. Minor nit; I did not like the volume being covered by the sleeve. It was hard to locate the switch, and it was difficult to make small volume adjustments once I had located the switch. The plastic holster was less satisfactory. It is large enough to get in the way when bending over or sitting in a chair. Also, replacing the iPhone into the holster was awkward at times, as you need to get the small plastic clips around the correct part of the rubber sleeve. Too high or too low, and the sleeve is not latched into the holster. The ToughSkin has a good protective sleeve, but the holster is not comfortable. MyMac rating 3 out of 5. In many regards, the zCover is the Toughskin done right. It uses an almost identical rubber sleeve for protection. Unfortunately, the volume switch is still covered. But the zCover uses a traditional belt clip that clips onto a round button on the back of the rubber sleeve. You remove the sleeve-encased iPhone by pushing down on a release button on the top of the belt clip, and lift the phone up and away. I strongly preferred zCover’s belt clip to Speck’s plastic holster. You also get a sport armband, which has the same belt clip type of attachment. Two ways of holding the iPhone for the price of one! MyMac rating 4 out of 5. The U-Suit takes a different approach to protecting your little bundle of joy. It forgoes the rubber sleeve, using instead of leather and plastic slipcase, while retaining the traditional belt clip. Since the iPhone simply slides into the U-Suit from the top, you can lift the phone out of the case for use, and “go commando.” Or, if you prefer, slide the whole case out of the belt clip, keeping the iPhone snugly help inside. That’s my preferred method. 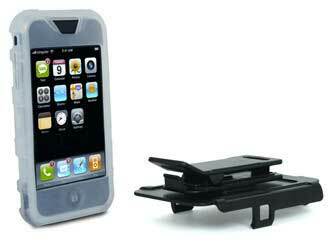 THe belt clip has a small, fold-out plastic support that allows you to prop up the iPhone while inside the holster. The U-Suit’s exterior is “fine leather,” according to the P.R. description, but if so, U-Suit’s cows need to go on a better diet. Grade A top grain leather, it ain’t. While the U-Suit holster is not as grippy as the rubber sleeve used by Speck and zCover, it is tactile enough to provide a secure grip. Most importantly, the volume switch is not covered, thus allowing much easier volume control. The U-Suit’s appearance is the most elegant of the three; it has an all-business look about it. Unfortunately, there is no armband. The belt clip is a bit different; there is no latching mechanism. The button on the back of the holster slides into a ratcheded slot in the clip. I sometimes found I had to push harder than I’d like to get the button to slide down past the ratchets. Most of the time, the phone slid smoothly into place, a few times I had to fiddle to get the phone clipped into place. Overall, I’d recommend the zCover for maximum protection and useability. The belt clip is better than Speck’s large plastic holster. The armband is a plus. If you want a more elegant look, and the ability to use your iPhone inside or outside the case, the U-Suit is the case for you. It’s the one I’m using on a day-to-day basis.